Changing pad Nomad gold stella/ dream pinkYou’ll go everywhere with the stylish Nomad changi..
Changing pad Nomad gold stella/ naturalYou’ll go everywhere with the stylish Nomad changing .. The ultimate diaper changing tool makes baby changing easy-no matter where you are. Our ultra-conven..
Wipeable changing pad won't absorb liquids or smells Safety belt Supports up to 30 lbs. Non..
Not all bathrooms are spacious. That is why this baby bath was developed. You can attach it to your .. The Changing Dresser Brevi Olimpia has been designed for a long-lasting use. 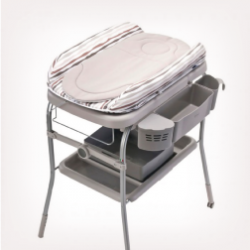 When you have a newborn..
Confort changing mat has two raised sides for added safety Made from soft plastic fabric, print..
Front zipper pocket for keys, wallet, phone, and personal items Drop it in any bag, strap it to you..
Changing table with a removable bath tub Padded change pad made from an easy-to- clean material.. Finally a bath and changer not only comfortable for children but also designed to guarantee maximum ..